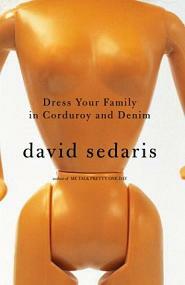 When my coworker lent me David Sedaris’ Dress Your Family in Corduroy and Denim, I had no idea what to expect; I had never read any of Sedaris’ work. I knew his sister Amy from Strangers with Candy, a TV show I thought was okay. I then had numerous coworker comment on the book as it sat on my desk for a month as it waited for me to finish reading Please Kill Me. Their words for the book were always complimentary, and not necessarily complimentary for this specific book, but rather Sedaris’ work in general. I didn’t know that this was a series of short stories when I began reading it on Friday, and didn’t even realized that the first story had ended. In all honesty, I don’t know what the appeal is to his Sedaris’ writing. I think he’s saying, “look at my fucked up family,” but I honestly think that watching my family during a Shabbos dinner would be more humorous, and we’re not all that funny. Sure there are some chuckle moments, but no gut splitting laughter moments. As I read these stories, all I could think was that I was reading the transcripts from episodes of The Vinyl Cafe, and while that show might make me chuckle and smile on a long drive, I don’t think it works in book form.